This Rollins approved program, run through The Education Abroad Network (TEAN), provides students the opportunity to live and study at the University of Otago and become fully immersed in Kiwi campus life! 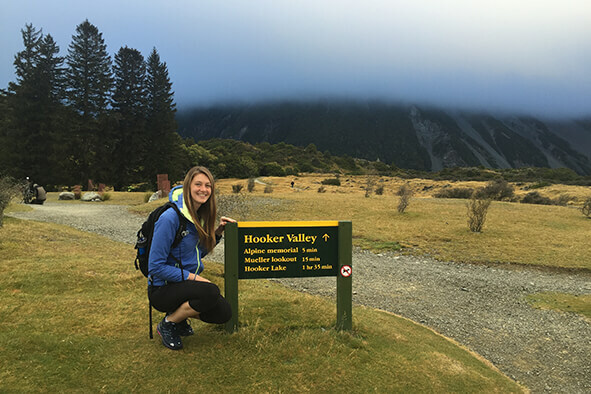 To experience New Zealand fully, students take courses related to the country and region and join campus activities and events with local students! This program allows students to make optimum use of their time in New Zealand through activities and excursions to places of historical, cultural, and environmental interest, and through living at university flats with several other international students and one Kiwi host student. The goal of the semester is to introduce students to New Zealand society and provide full immersion into student life at New Zealand’s oldest university and largest residential campus in the southern hemisphere. The University of Otago is also one of the world leading research institutions for Business, Humanities, Health Science, and Science. The program provides students with the opportunity to partake in a wide range of course from different disciplines. New Zealand is widely considered the adventure capital of the world! So your program starts with an action-packed orientation in NZ’s capital city, Auckland. It includes a wide range of activities, such as zorbing and rappelling alongside waterfalls. Of course, no orientation to NZ is complete without an introduction to Maori culture. You’ll spend time with local Maori guides who will provide a fun and interactive introduction to their history and culture as well as insight into how Maori culture influences contemporary life in NZ. There are truly few places more scenic than Auckland and the surrounding region, and TEAN will take you to some of the most picturesque spots on the North Island. The aim of orientation is to equip you with a strong support structure and foundation on which to build your semester in NZ. After this adventurous, five-day program, you’ll feel confident navigating all things Kiwi – from the country’s academic structure to settling in and meeting the locals. Although you are responsible for booking your own flight to Dunedin, TEAN will assist you through one of their preferred vendors (which is not an airline specifically, but more like a booking agency). TEAN will provide the vender with all relevant arrival/departure details pertaining to this program. Rollins strongly recommends that you use this vendor as they are not only trusted, but they also have all of the details regarding your routing; such as which cities you'll need to stop in as part of your orientation and how long you'll be in those cities. The estimated cost of this flight, departing from the U.S. west coast, is approximately $2,200. You will also need to book your own airfare that takes you from home to the U.S. west coast. U.S. citizens DO need a visa in order to study in New Zealand. The NZ visa application is an entirely online process and payment must be made by credit card at the time of application (apprx. $40). For more information about the visa process and visas for non-U.S. citizens, see our Passports and Visas Page. TEAN is a study abroad organization based in Chicago, and it runs and operates this program in coordination with Otago. TEAN has been developing high quality study abroad programs for American students since 1995 by establishing partnerships with universities across the South Pacific and Pacific Rim. TEAN will provide Rollins students with a comprehensive orientation program, organized cultural activities in and around Dunedin, and the support of a full-time, local Resident Director. Otago was founded in 1869 and is the oldest and largest residential campus in New Zealand. It has been consistently ranked amongst NZ’s top 3 universities. Just under 20,000 students attend Otago, including 1,800 international students from nearly 100 countries around the globe. The International Office at Otago offers comprehensive support to incoming visiting students who can take full advantage of the incredible array of curricular and co-curricular offerings. New Zealand Studies Courses: Students must choose at least two courses from this list of New Zealand Studies courses. Students will then select two additional courses from the wide variety of courses available to visiting students, pending equivalent prerequisites and enrollment capacity. Click here to see the full list of available courses. NOTE: When reviewing course options, make sure the course is available "Semester 2" (equivalent to our fall semester) or "Semester 1" (equivalent to our spring semester). Students who complete a semester at Otago typically receive 16 semester credit hours for four courses. Rollins Credit equivalency for University of Otago courses: 18 or 20 course units = 4 credits at Rollins. The academic system in NZ can be quite different than the U.S. system. There are generally fewer class, or contact hours, per week than in the U.S., and there is less continuous assessment of your academic performance. Semester grades are typically based on only one or two major assignments, such as a midterm and final exam. Daily assignments are rare. Therefore, each paper, assignment, test, project, etc. often carries more weight for your final grade than what it might carry here at Rollins. There will be a great degree of self-discipline and self-directed study required. You'll be expected to be much more independent. Contact with professors is more limited, and most professors have a lecture-based teaching style. Thus, students are generally expected to keep up with coursework and reading without prompting. In addition, students entering university in NZ are typically already focused in their major or academic specialization. Thus, introductory courses at Otago typically cover topics that might not be covered until later levels at Rollins. For example, 100-level courses at Otago are considered introductory, or equivalent to U.S. first and second year courses. 200-level courses are considered intermediate, equivalent to our junior level courses. And 300-level courses are considered equivalent to our senior level courses. Students participating on this program will need to seek approval for courses in their major/minor (from the appropriate academic department) and for general Rollins credit (through Student Records). All courses on this program will appear on the Rollins transcript as transfer credit. Grades from this program will also appear on the Rollins transcript and will be factored into the Rollins GPA. Students who successfully complete this program through Rollins will receive an official transcript from Otago. It can take up to 3 months to receive the official transcript. Students will be living at a university flat for the duration of the term. The flats will be comprised of several international students and at least one Kiwi host. Having a Kiwi host will help integrate the students to the University, social life, and New Zealand culture. Meals are not included in the program, but the university flats are centrally located and are within walking distance of the campus, center of town, small shops, cafes and restaurants. Students are responsible for buying and cooking their own food, as well as having the opportunity to go out to local eateries on and off campus. Students in the program have the opportunity to join the Otago University Student association, membership is free. This is an organizations provides students with over 60 sport, social, and academic clubs. The association organizes an array of events which include social events, excursions off campus, and free student breakfast. UniPol, the university gym, has basketball courts, weight rooms, cardio equipment, badminton courts, pool tables, yoga, Pilates, and personalized exercise programming. The International Office provides the opportunity to partner with local organizations to volunteer. The International Office will also be organizing activities throughout the semester such as hikes, rugby matches, socials, and activities exploring the local culture which offers a vibrant art scene with multiple theaters, art galleries, and renowned restaurants. We strongly encourage students to take advantage of these offerings—this is one of the best ways to meet local and other international students. In addition to the orientation activities, TEAN offers optional mid-semester excursions across the South Island and to Thailand (both for additional fees). Tuition and program administration, accommodation, complete medical and emergency insurance, orientation, transportation between Auckland and Dunedin, and cultural activities. Scholarships based on financial need are available to off-set costs associated with international airfare, and, in exceptional cases, other costs associated with study abroad. Students can apply for scholarships inside of their Rollins RIPA application. Advising is offered on a walk-in basis, Tuesday - Thursday from 12pm - 2pm during normal semester dates. If you are unable to make it at these times, please email, call or stop by our office to arrange an appointment. We can also put you in touch with student program alumni who would be happy to share their experience with you. You may also want to review our blog site to see what past students have said about their adventures on this program.